One bed cover, ready to go. 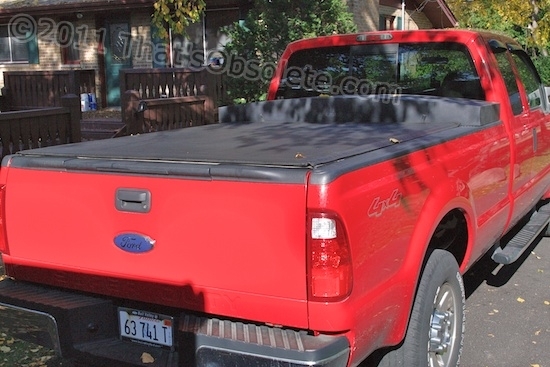 The truck bed tonneau cover manufacturer Truxedo and its dealers will tell you that its original Truxedo model cannot be shortened en situ, and that about $520 will get you a special-order cover of another model in a few weeks. Now the original Truxedo cover is a quality piece, a solid design with very durable materials, and mine cost me about $400-plus four years ago. It can be mounted to the bed by one person in a couple of minutes, using its clamping system. It opens and closes easily, without snaps. Although the tonneau material does not seem to shrink or weather, it can be re-tensioned in another minute or so if needed. For a cheapskate like myself, the Truxedo is one of those few products that you pay substantially more for and don’t regret a penny of it. But, I hated the thought of ditching my perfect $400 cover to then lay out again for a $500 replacement. A local Truxedo dealer understood my plight and pointed me to a local boat dealer, who then pointed me to a local boat cover maker that he said had made a custom bed cover for a local rodder. Rietesel’s Boat Covers in McHenry, Illinois had to squeeze me into their busiest time of year, but thankfully did so a week before my planned departure date. He would have preferred to fasten the front rubber seal to the tank, but since it’s a plastic water tank, that’s a no-no, so he simply let it drape down. Doesn’t matter much to me, since everything in the bed that’s water-sensitive is held in closed tubs. I can always play with it later to see if it’s long enough to drape upward, but that’s not worth goofing with now. Thank you, Mr. Rietesel! This is one of those places that’s a pleasure to do business with and recommend. Now I can hit the road with a usable bed that doesn’t openly display all that it has to offer.